Food is a fundamental part of life — we all eat! Food crosses all cultures and connects people. A place at the table brings us together to share a meal regardless of our cultural background, beliefs, or language. It’s no surprise that the food industry is an attractive for entrepreneurs. After all, everyone has to eat. Starting a food business has to be one of the most challenging businesses to get into. The food industry is very competitive so it is imperative that you do your research before getting started. Doing your research will help you to define your target market and identify risk factors. Food entrepreneurs face challenges while getting their product to shelf. Some of these challenges include being able to afford certified commercial kitchen space, renting equipment, and obtaining capital to fund the business. Food business incubators are helping these food startups grow by providing them with commercial kitchen spaces, packaging and distribution support, and even networking events. 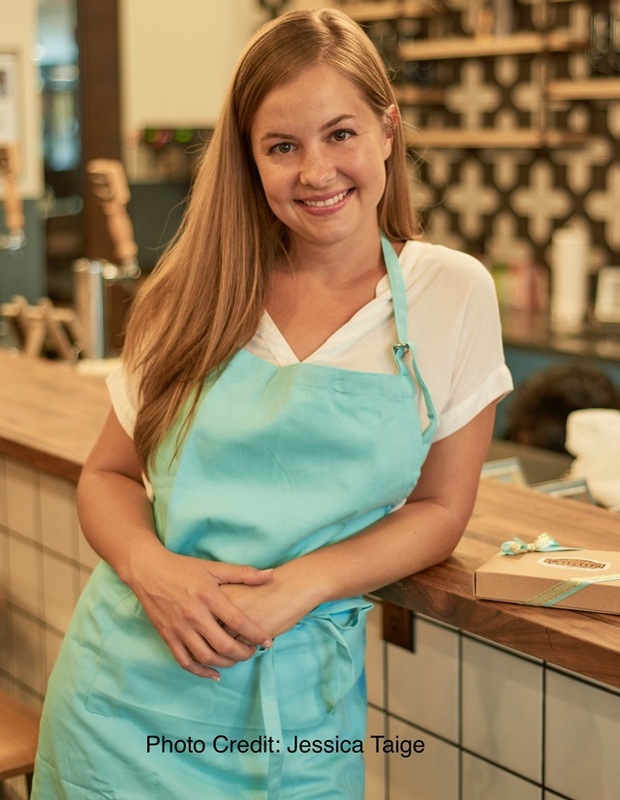 Jessica Taige is the Founder and Owner of Jessie's Nutty Cups. Jessie's Nutty Cups are handcrafted peanut butter cups made in a variety of fun flavors. Every cup is made with Jessie's own secret recipe peanut butter and put together by hand. How did Jessie’s Nutty Cups get started? I originally naively thought Jessie’s Nutty Cups could supplement my income while working on my acting career. I made my first peanut butter cups back in 2014 for a friend’s farewell party, and while they were good, I wanted to make them better. Everyone I knew became my testers, and it wasn’t long before I had an overwhelming demand for my luscious peanut butter and chocolate bites-and Jessie’s Nutty Cups was born. Quality ingredients combined with the love and passion I put into these handcrafted peanut butter cups is what blew away my friends and continues to drive the production of these amazing bites. I have come up with 7 different stock flavors, including the Dark Sea Salt Cup and the PBJ cup. Additionally, every month brings a new flavor, such as the Nutty S'More Cup, or the Nutty Love Cup (inspired by my grandmother's Black Forest Cake). What's the biggest startup lesson you’ve learned so far? It takes time and a whole lot of patience and dedication, but if you stick with it and do the work, you really can succeed. What is the one challenge you faced with the company? How to staff while you grow. What can I pass on to someone else so I can focus on growing the business? What tips will you give to aspiring food entrepreneurs? Join a community of small businesses in the field, like HBK Incubates. I attended their Prep for Success business planning class for food entrepreneurs. Before joining HBK, I felt like I was constantly running against a wall. After meeting with fellow business owners, particularly those of other aspiring food enterprises, I realized I wasn’t alone, and that I actually knew a lot more than I thought. Success is getting to see the fruits of your labor. What skills are you looking for in your employees? Detailed oriented, creative, and reliable. Food is the way to connect to others. I used to work 7 days a week with 3 jobs and it was hell on earth. I was miserable. Work-life balance is extremely important to me. I learned it’s ok to take me-time. In my spare time I enjoy exploring new neighborhoods, reading, getting back to my roots, and singing through musical theater. My dream has always been to be a Broadway Actress for as long as I can remember. I studied theater and music in school. While my dreams have shifted a bit, acting and singing are definitely still a huge part of me, and still a part of my dream. What stores can customers find your products?